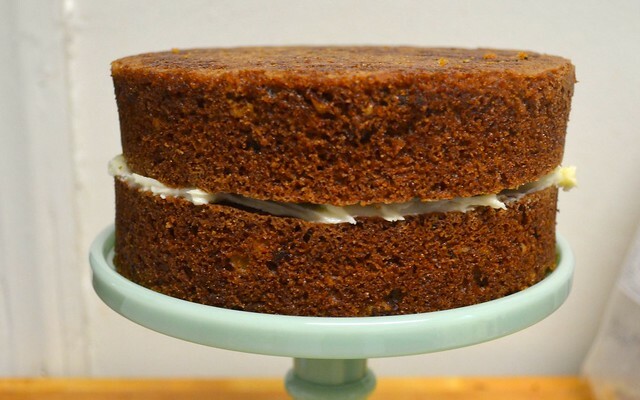 Recently I had a seriously strong hankering for some carrot cake. You know, as I often do. 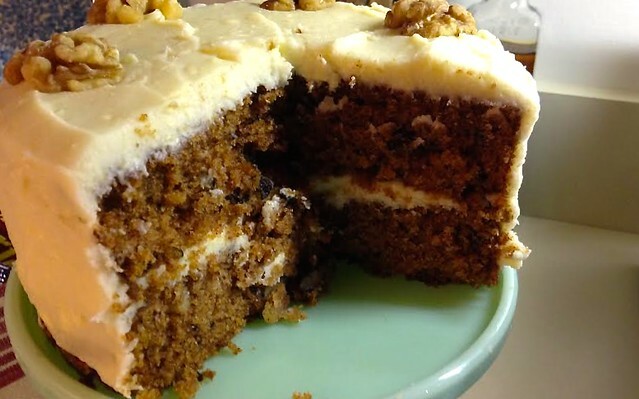 And carrot cake happens to be one of those cravings that can't be ignored or substituted for something lesser. If you try, you will only be disappointed and find that your craving has only intensified. And sure, there are places around to get a quick fix (including the new bakery within walking distance from our place, danger, danger), but I always tend to enjoy the making process a little more when I know what's coming next. 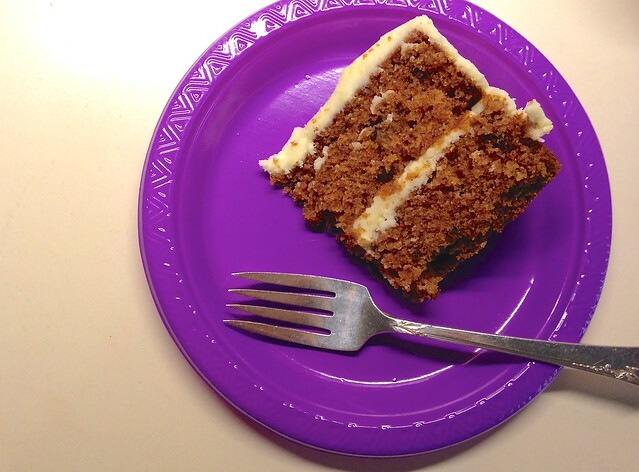 The quelling of the craving is more satisfying when there's a little labor involved, especially when said labor rotates around a cake-typical occasion: birthdays. My mom's birthday is at the end of November and my own is in the beginning of December (okay, today, it is today), so usually when we all gather together for Thanksgiving, we tend to throw in a little birthday celebration, too. So, maybe I sort of made my own (joint) birthday cake, but as cute Colin said, that is a true sign of adulthood and I think I'll take it. Begin by preheating your oven to 350 degrees. Butter two 6-inch cake pans (or if you prefer cupcakes, this recipe makes about one dozen) and line the bottoms with parchment paper. Butter and flour again and set aside. In a medium bowl, whisk together your flour, baking soda, salt, and spices. In a large bowl, whisk together the sugar and canola oil until evenly combined. Whisk your eggs into the sugar mixture one at a time. 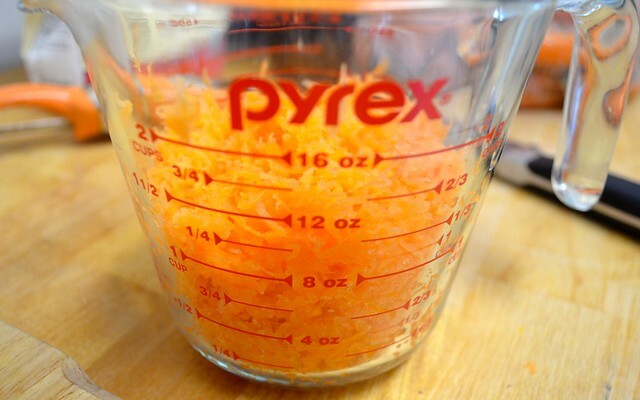 Add in your dry ingredients in increments and fold together. 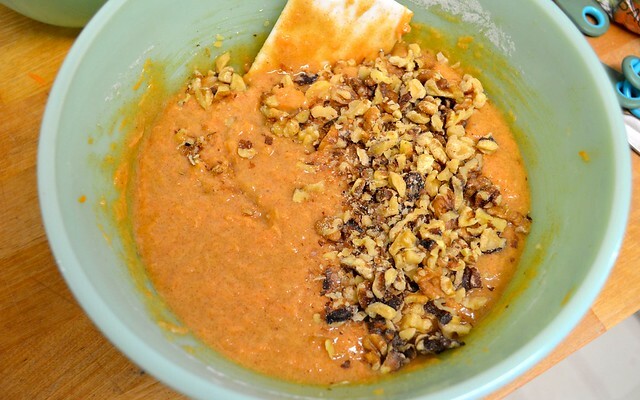 Finally, fold in your shredded carrots and walnuts until just mixed. Transfer your batter to your prepared pans and bake for 30-40 minutes. The best way to know when a layer cake is done? Sure, you can do the toothpick coming out clean method, but also try this: tap the center of the cake. Does it bounce back? Check the sides of the pan. Has the cake started to pull away from the edges? If the answer to both of these questions is yes, the cake is done. 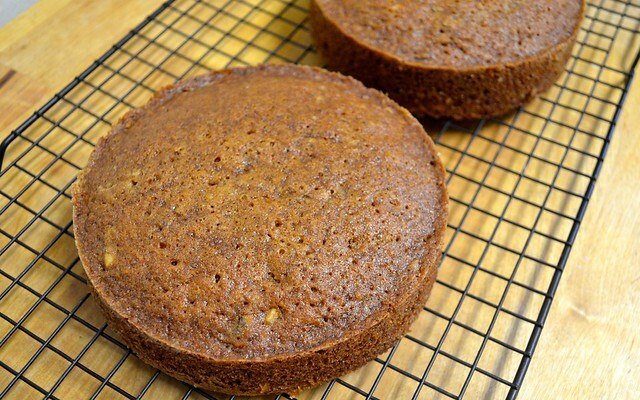 Move your cakes, still in the pans, to a cooling rack for about fifteen minutes. Carefully flip out of the pans, remove the parchment paper and allow to cool completely. While you wait (and while the kitchen smells like carroty-spicy heaven), you can whip up your frosting. 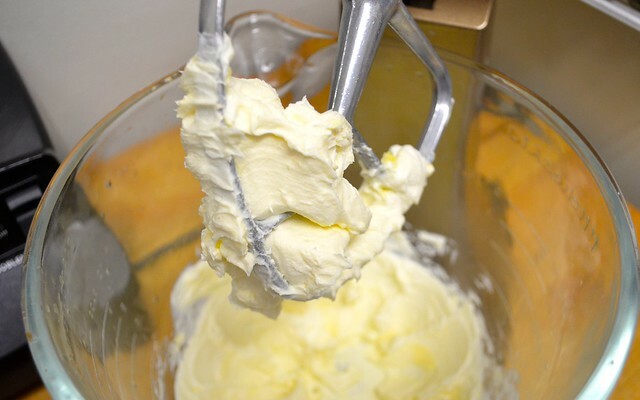 In the bowl of a stand mixer using the paddle attachment, beat your butter and cream cheese together until fluffy. Slowly add your confectioner's sugar (in 1/4 cup increments) and whip together until no lumps remain. You can also sift your powdered sugar first, but to each their own. Refrigerate the cream cheese frosting for about 15-20 minutes before using, as this will help it set up and make it easier to spread. When your cake is fully cooled (you may need to slice a little bit off the top to flatten the layers, which you can then eat and no one is mad about that), spread a bit of frosting on top of one layer, then stack your cake. Cover the cake in more frosting until completely covered and/or until no frosting remains in the bowl. Unless you want there to be some left so you can scoop it out with a spoon. No one is judging. 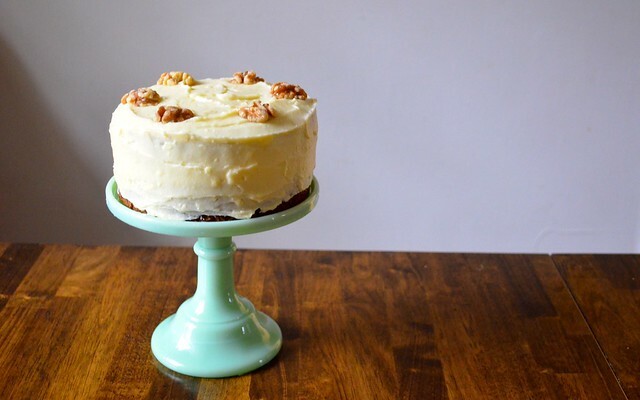 Oh, carrot cake craving. I can't think of a better way to ring in a personal new year. 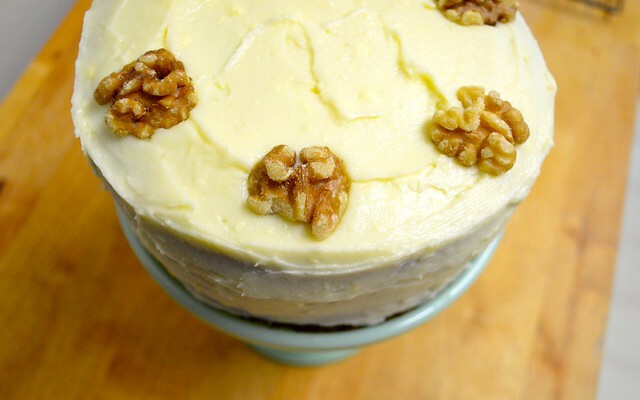 You could top the cake with a few decorative whole walnuts or, if you haven't eaten the leftover frosting, you can use a piping bag to get a little decorative. It's been a good year. A full year, some wild turns, and a lot of successful (and a few failed) recipes. 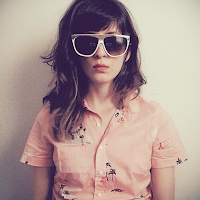 Want to know what else I learned while I was 27? 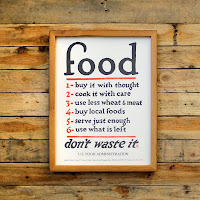 I made a list of life learnings here.